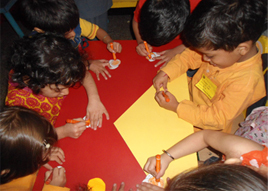 Our school’s curriculum is comprehensive and based on core subjects, going beyond, simply facilitating academic books knowledge but also aiding the development of concepts ideas and skills. 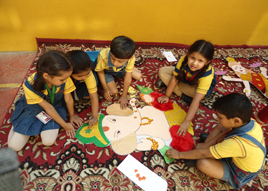 Hence it aims at providing a natural blissful learning environment for an all round growth and development of healthy body, mind and soul by employing the proven, simple and effective learning techniques. 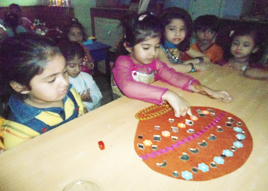 The curriculum follows the teaching – learning strategies which revolve around the concepts of learning by doing in an open uninhibited environment that allows the freedom of thought and action. 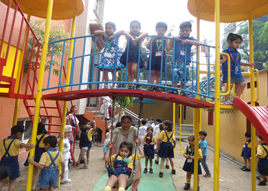 It also offers a balanced over-all growth environment with holistic approach including all the important aspects of the growing up years such as physical, social, intellectual, emotional and psychological. Here, the skills are integrated through music and dance, art and craft , games, storytelling, social events, festivities celebration, play-way activities etc. Apart from the main subjects like Hindi, English, Math etc. the other subjects are also included in the academic curriculum like G.K. , Computer Application and Art and Craft.